bl.uk > Online Gallery Home	> Online exhibitions	> Asia, Pacific and Africa Collections	> Kashmir: Bij Beara. Plate 8 from "Recollections of India. Part 2. Kashmir and the Alpine Punjab" by James Duffield Harding (1797-1863) after Charles Stewart Hardinge (1822-1894), the eldest son of the first Viscount Hardinge, the Governor General. This represents a view of the town, Bij-Beara located between Islamabad and Kashmir. 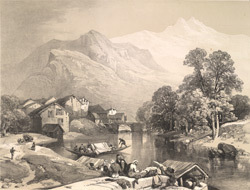 Hardinge wrote in 1846, "This place is one of the most important towns in the valley, and is built on the banks of the Jylum. Near it are the celebrated saffron fields of Kashmir, which, when in flower, communicate a delicate purple tint to the plain they occupy."